Alfred A. Knopf, New York, 2008. 36 pages. 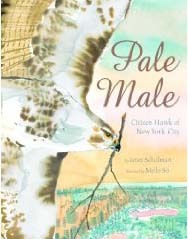 Here’s a beautiful picture book true story of a red-tailed hawk that flew into New York City in 1991 and made his home on a building across from Central Park. The building occupants weren’t too happy with a nest on their building, though the citizens of New York were thrilled. The hawk’s pale coloring made him distinctive and easy to spot, so bird watchers avidly watched his efforts to settle in and start a family. Lovely watercolors illustrate this gentle story of a wild creature learning to live alongside humans. It also tells how important the efforts of humans were for him to be able to keep his home. Frances Foster Books (Farrar, Straus and Giroux), New York, 2007. 2008 Robert F. Sibert Medal winner. 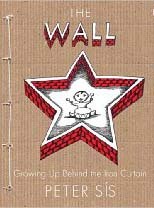 In a picture book for children, Peter Sis here creatively captures what it was like to be an artist growing up in Czechoslovakia behind the Iron Curtain. With his art, he expresses to the reader the feelings of the students who did not want to be repressed. This book reminded me of Persepolis, another story of a student growing up under oppression, also told with art. The Wall is simpler, and thus more suitable for children, intelligent children who will think about the images and read the fine print. Hmm. It’s also suitable for intelligent adults who will think about the images and read the fine print. This book is a powerful testimonial against repression. Her story is incredible — especially incredible that she survived it. She has lived through addiction, time in prison, desperate poverty, hospitalization, failed marriages, the death of a son. And throughout the telling of her story, she draws beautiful, life-affirming insights. After reading this book, I find myself praying blessings upon Melody Beattie — because of how powerfully she has blessed me. If you want a reminder of how powerfully God can redeem desperate situations, I highly recommend this book. Schwarz & Wade Books, New York, 2008. 36 pages. In honor of Abe Lincoln’s 200th birthday, here’s a children’s picture book telling a story of how Abe Lincoln almost died when he was only seven years old. 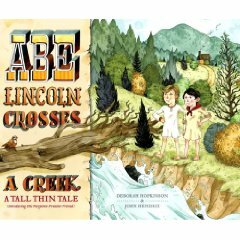 Yes, Abe and his friend Austin were crossing a creek. Abe fell in, and his friend fished him out, saving his life and thus making a difference in the world for generations to come. Deborah Hopkinson has a delightful, folksy way of telling the story, talking about what we know and what we don’t know. The pictures of the green Kentucky valley where Abe lived and the mischievous boys add to the fun. Here’s an endearing tale of friendship, suitable for young readers or listeners who might be tired of more straitlaced and serious stories of Abraham Lincoln. He did a foolish thing crossing that creek, but his friend saved him. Even Abraham Lincoln needed a friend. A friend recommended Patricia Evans’ first book, The Verbally Abusive Relationship, to me. I found what I began so helpful, I checked out all of her books. I seem to be finishing them in the opposite order in which they were written. However, I am finding each book tremendously helpful. In the introduction, Patricia Evans says, “You are not alone in your desire to understand the problem of control. Thousands of people have asked me, “Why would anyone act ‘like that’?” They describe the way they’ve been treated, and they wonder what compels one to try to control others. “Why don’t most people who try to control others see that they’re being oppressive? Are they under a spell or what?” they ask. “Many people have also asked why they can’t seem to stop attempting to control others, even when these destructive behaviors are driving their loved ones away. They often say that something seems to “come over” them and things “go wrong.” At times, they are so unaware of their behavior and its impact that they don’t realize that anything has gone wrong until it’s too late — a loved one has left or violence has erupted…. “If someone defines you, even in subtle ways, they are pretending to know the unknowable. There is a quality of fantasy to their words and sometimes to their actions. Even so, they are usually unaware of the fact that they are playing “let’s pretend.” They fool themselves and sometimes others into thinking that what they are saying is true or that what they are doing is right. “When people “make up” your reality — as if they were you — they are trying to control you, even when they don’t realize it. “When people attempt to control you they begin by pretending. When they define you they are acting in a senseless way. They are pretending. When people act as if you do not exist or are not a real person with a reality of your own … they are pretending. In this subtle and often unconscious way, they are attempting to exert control over you — your space, time, resources, or even your life. “We know that they are pretending because in actual fact, no one can tell you what you want, believe, should do, or why you have done what you have done. No one can know your inner reality, your intentions, your motives, what you think, believe, feel, like, dislike, what you know, how you do what you do, or who you are. If someone does pretend to know your inner reality: “You’re trying to start a fight,” they have it backwards. People can only know themselves. It doesn’t work the other way around. “Since you can only define yourself, your self-definition is yours. It isn’t necessary that you prove it or explain it. It is, after all, your own. Self-definition is inherent in being a person. The author doesn’t leave it at that. She does offer suggestions for how to become a Spellbreaker and break the spell that Controllers seem to be operating under. Even if the Controller in your life does not change, she shows you ways to break out of the influence of the spell yourself. At the very least, the understanding of the dynamics involved helps break the crazy-making aspects of being exposed to these irrational behaviors. Fireside Books (Simon & Schuster), 1999. 96 pages. 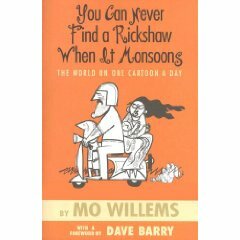 I’ve recently discovered SARK’s delightful books. They’re gift books, and they are works of art. She hand writes them with colorful rainbows of ink, with the pictures and the words expressing the exuberance. This particular book is especially fun. 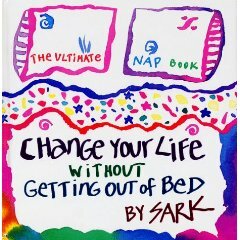 I started to say that it’s in defense of naps, but I think it’s better to say that this book is in celebration of naps. There’s nothing defensive about her attitude toward taking naps! Instead, she explains how much wonderful good naps can bring into your life. I finished reading this book on a day when I was scheduled to work 12:30 to 9:00. Usually, I try to get lots done on such mornings. That day, I did not have a “productive” morning, but I did have a very lovely one! St. Martin’s Paperbacks, 1998. First published in 1972. 437 pages. I doubt I need to say much about this classic story of James Herriot’s tales of starting out as a young veterinarian in the Yorkshire Dales. I’m quite sure I first read it sometime when I was in elementary school. They’re wholesome stories, and I enjoyed them as much then as I did delighting over them as an adult. I thought I’d reread All Creatures Great and Small to give myself some good laughs in between other books. Since the book is mostly episodic — with mainly separate, funny stories — it works well to read it in bits and pieces. There are overarching threads, like the memorable characters of his employer Siegfried and his brother Tristan. But mainly the book tells delightful, funny, and heartwarming tales of his work with animals and the farmers of the Dales. This book is definitely the sort worth coming back to every few years to enjoy all over again. Harcourt, Orlando, 2008. 32 pages. Here’s a sweet bedtime storybook. “I can only sleep in a blue room,” says Alice. “Ah. . . but smell,” Mama says. Mama keeps bringing more lovely things that aren’t blue, but are wonderfully soothing. Alice keeps protesting, but getting sleepier. The lovely part is that, when the light goes out and night falls, sure enough, everything in the room is blue. 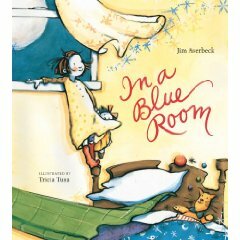 The story is told in lyrical, soothing language, just right for bedtime. Good night! You are currently browsing the Sonderbooks blog archives for February, 2009.